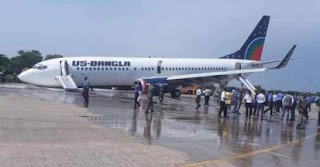 A Boeing 737-800 of US-Bangla Airlines operating flight BS141, from Dhaka to Cox’s Bazaar has had to make an emergency landing at Shah Amanat International Airport in Chittagong. The dramatic landing this morning following technical problems notified to the airport by the captain who requested an emergency landing. The aircraft came in as normal but landed with the nose gear apparently retracted. The airports emergency responders were fast on the scene as passengers on the aircraft used the emergency slides to vacate the aircraft. The Boeing 737-800 registration S2-AJA took off as normal from Hazrat Shahjahal International airport in Dhaka at around 1130am, landed with nose gear retracted. There are no reports of any injuries to passengers or crew at this stage. US Bangla has not yet responded to our request for comment.